adidas is making big moves this year. The brand is gaining major ground on the competition with smash hits like the Yeezys, Tubulars and our favorites, the Adidas NMD. The NMD released globally on December 12th, 2015, but adidas quickly added a number of release dates for new colorways / packs to take advantage of the popularity. 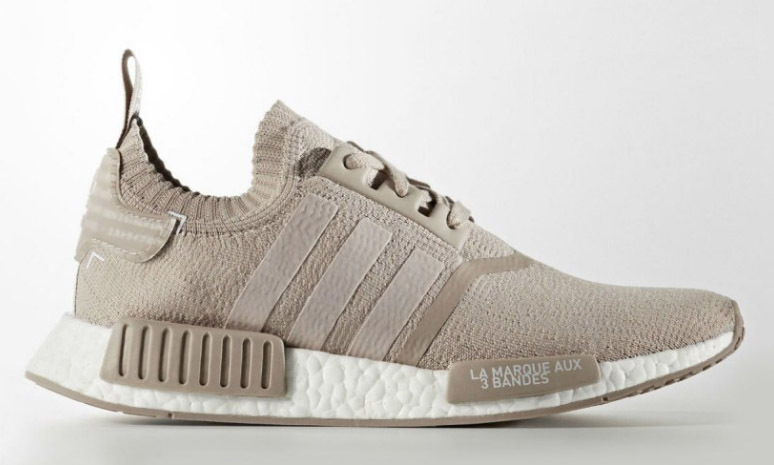 In this post, we’ve compiled all the packs, colorways, release dates and where to buy the NMDs, and will continue to keep this list updated as they drop more. NOTE: This list is MEN’s only. 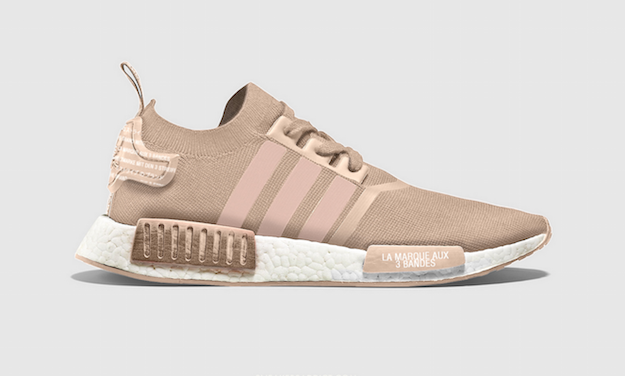 We have a post dedicated to the WMNS version of the NMD here. The Runner Primeknit’s were the first in the series. The sneakers were only available in 1 colorway – black with white soles (red and blue in the soles as well). The sneaker’s most notable feature is something we’re seeing a lot of lately – a seamless Primenit upper, which looks (and functions) like a sock. 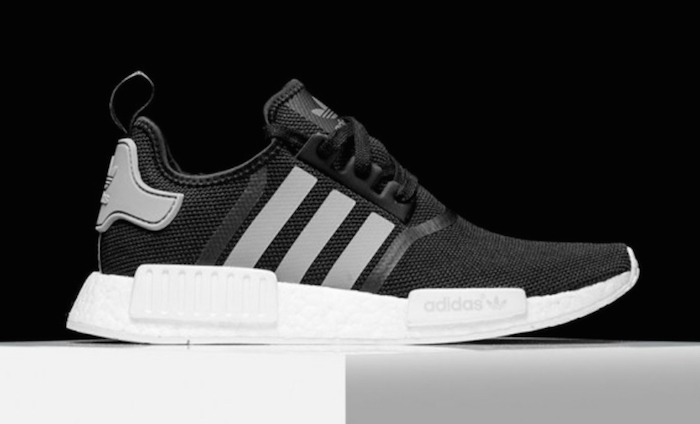 The adidas marketing team snuck out an early, limited release of the NMD in a black and silver colorway. The premium Consortium version featured a similar black upper sole with added reflective 3M accents and silver highlights around the sole. These sneakers dropped on a limited release (only 1,000 made) and were only available through select retailers. The team had a small release of ‘friends and family’ only NMDs that are not available for purchase anywhere. 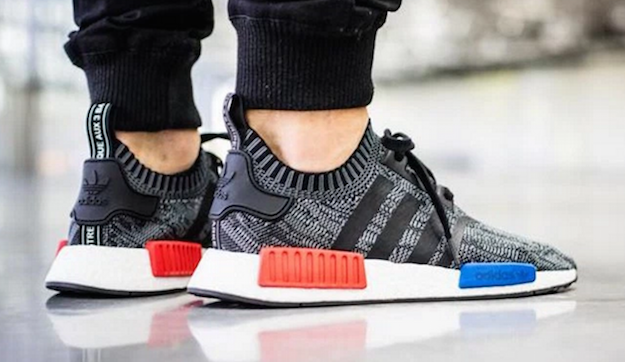 The Friends and Family pack featured a similar design of the Primeknits, but with the iconic 3 stripes added on top. 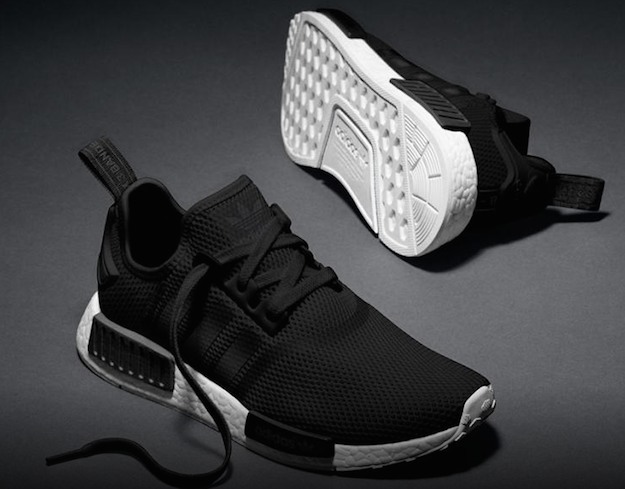 While this release of the NMD had the same silhouette, the R1 pack has a much different look. There is no branding (i.e. adidas 3 stripes) on the on the sneaker and features a static grey and white upper sole. This is when we begin to see adidas really investing into the NMD brand with some new, fresh colorways for the warmer weather. This release added some much needed color to a sneaker that had just featured black and grey tones. The “Yellow Golds” take the same static look and replace the greys with a nice pop of yellow. Another spin on the previous Primeknit design, adding a large splash of red with a new twist. This pack was released at Nice Kicks in San Fran on 2/6, but widely released on the web on 2/20. 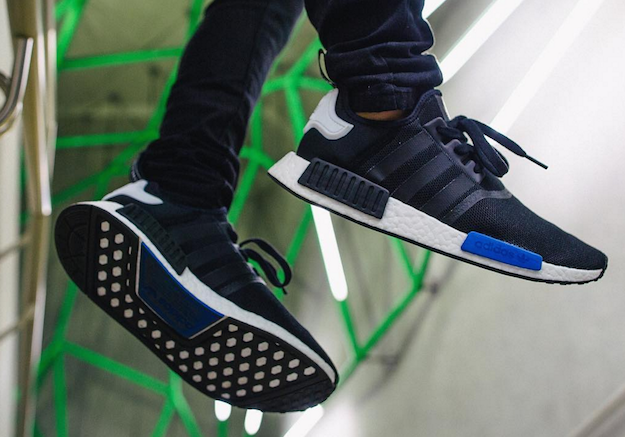 We just got word that adidas will be releasing an updated version of the original NMD drops that will be exclusive to Footlocker. This new take on the OG colorway (see difference in images below) features more of a mesh upper and more black throughout the sole. We’re really digging the update on the OG colorway and will be first in line to cop when they drop. As a part of their large spring release, adidas is giving us another colorway in the R1 series. The body of the shoe is full knit, with colors blocked off by section. The heel is grey and the front of the shoe is orange and grey. The shoelaces are also different, following the same speckled pattern as the heel of the sneaker. 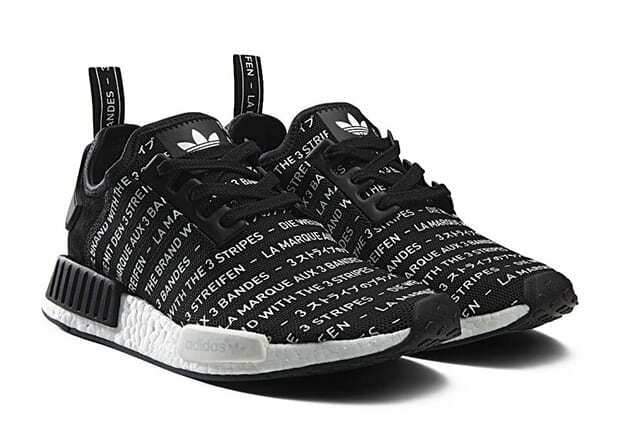 Images of the all black NMDs have been floating around the web for a while now, but with no confirmation as to whether or not they were real or officially releasing. Modern Notoriety reports they will be releasing this spring as a part of the larger spring release, along with a bunch of additional colorways. Adidas launched a mini video campaign on their Instagram account this past week, featuring videos of sneakerheads in various cities across the planet rocking the new city pack. 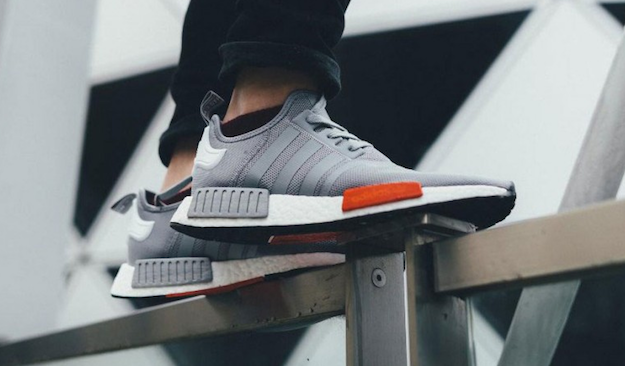 First up, the “Moscows”, a light grey rendition of the NMDs. We just got word these will be releasing on the massive 3/17 drop date. The Tokyo Blacks are the 2nd of the 3 city pack releases, featuring an all black top silhouette with a white heel. 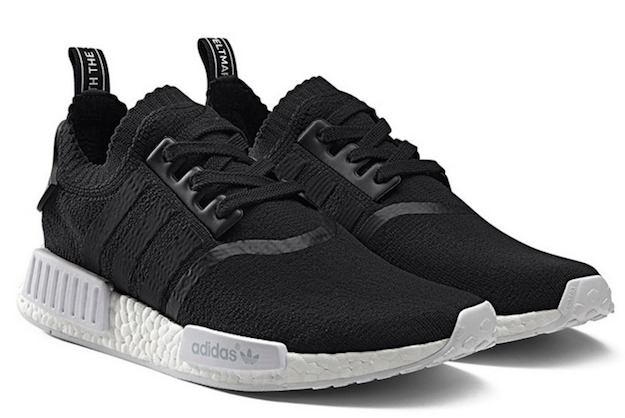 They’re very reminiscent of the OG NMDs, with the exception of the black heel plug (as opposed to red on the OG). 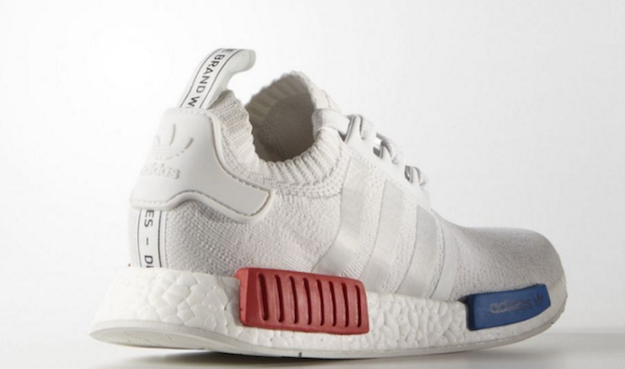 Arguably the cleanest sneaker out of the entire NMD pack, it’s rumored to only be available in women’s sizes. To be honest, I’d bite the bullet, size up, and get them anyways – they’re that clean. Yet again, the design team throws a curveball by releasing some mid cut sneakers into the pack. The city sock almost reminds me of the Jordan Future, a slimmed down version of the OG that tapers out right under the ankle. The entire upper sole is smooth with no branding or writing – almost like a high top sock. We were trolling Instagram yesterday when we noticed these images of the new mid sock CS_1 in a new colorway. 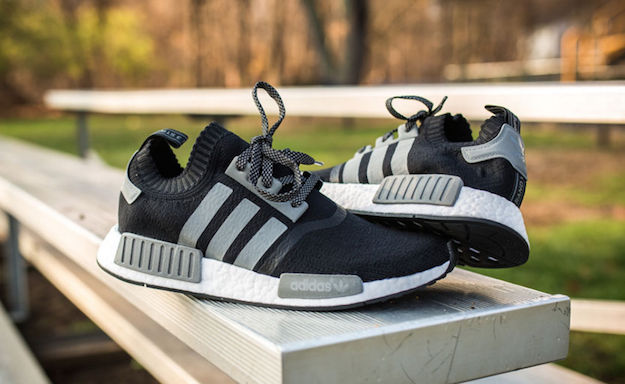 These are slated to release in the Spring of 2016, along with a handful of other colorways. We just got word (on 3/8) that this red version of the prime knit was dropping later this month. These are a nice pile on to the yellow PKs featured earlier in this article, with a red camo upper sole with bright red accepts. Definitely a good summer sneaker. 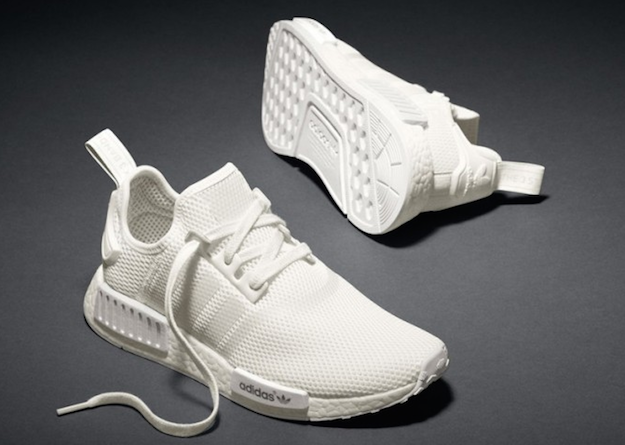 Right on the heels of the “red camo” NMD releases, adidas unveiled the all white version of it. This version is very similar to the red version, but with white highlights in their wake. These are set to release at the same time as the reds. Rounding out the camo NMD release is the olive colorway. This drop almost has the feel of my grandfather’s couch … in a good way. These will hit stores the same day as the red and white camo colorways, April 9. I just saw these on adidas Instagram account. They’re dropping a deep blue version in the camo pack, also set to release on April 9. At first, I wasn’t sure on these. But, they;re different – I like different. Plus, I’ve always been a fan of chukkas, these shouldn’t be any different. I was trolling the Instagram feed when these were posted and the general consensus seems to be the same – adidas has stepped their [email protected] shoe game up. 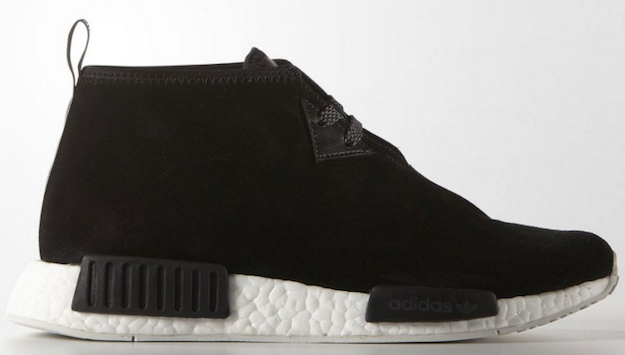 The mid chukkas will also come in black. There’s still no official word from adidas about the launch of these suede kicks, but as soon as we hear, we will pass it right on to you guys. adidas dropped the “Vintage White” chukka just a few weeks after the red and black versions. I have to be honest, I’m not overly crazy about the previous versions – but these, I like. A lot actually – definitely a nice light summer shoe. Adidas just announced the release date for 2 new NMD colorways as a part of a micro pack dubbed “Geometric Pack”. If you look closely as the body of the sneaker you’ll notice some dark color blocks, hence the geometric came. 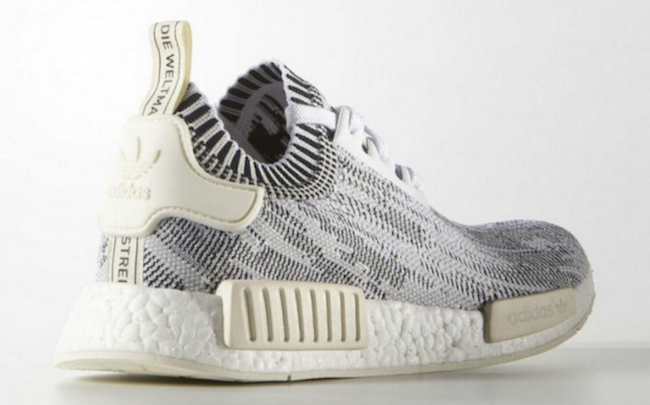 These are set to drop as a part of a massive NMD release on 3/17/16. Just like the red version covered above, there’s a black bodied version of the “Geometric Pack”. These are also set to go on sales 3/17/16. 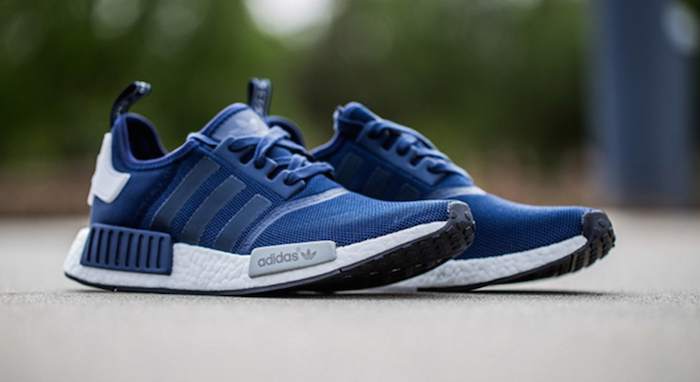 We just got word that adidas added a new “navy blue” colorway to the “mesh pack”, a pack we were previously told was called the “city pack”. 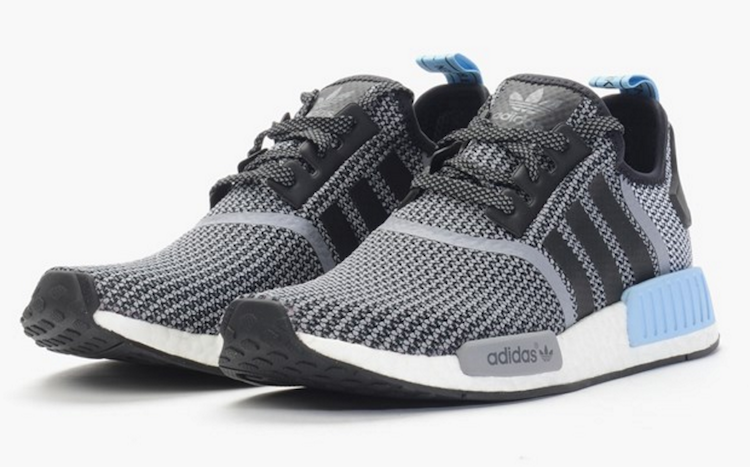 Whatever you want to call them, these are dropping as a part of the massive St Pattys day drop along with about a dozen other new NMD colorways. 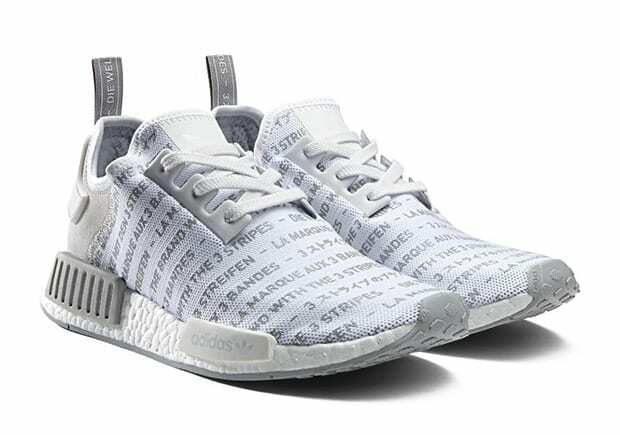 I was scrolling down my Instagram feed this morning when I saw these all white NMDs fly by. 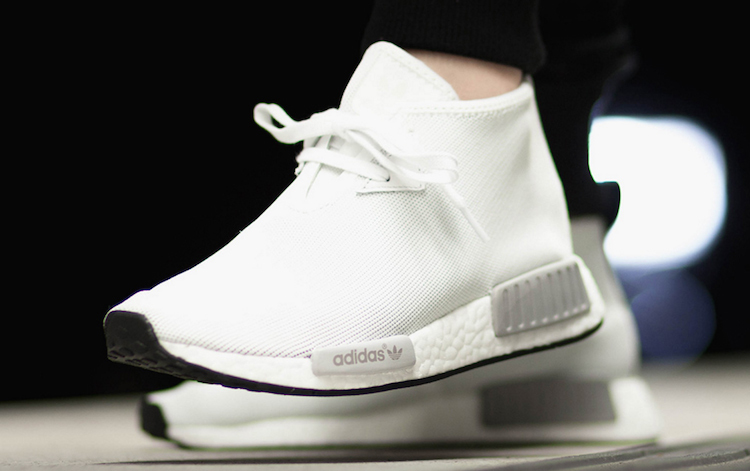 There’s been a few white renditions on the NMD (dropping soon), but this is the first all white version. These are set to drop as a part of a “monochrome pack” (still waiting for details on additional colorways) on March 17th. The double blacks are a complement to their all white PK running mate. 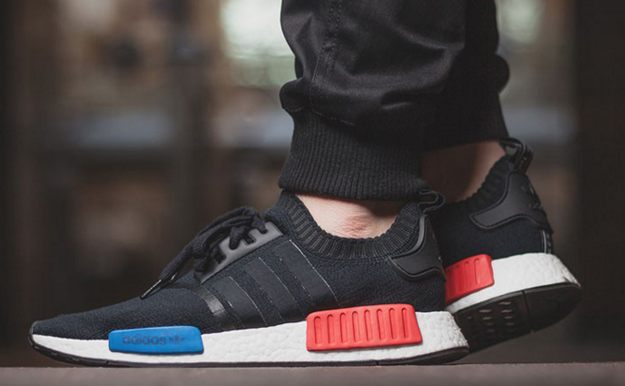 The top of these knits is completely black – 3 stripes, tongue and through the body. The bottoms are all white, including the bottom the sole. These are also a part of the massive St Pattys day drop. It was borderline confusing when I saw adidas was dropping 2 more colorways in the monochrome pack that were also all white and double black. 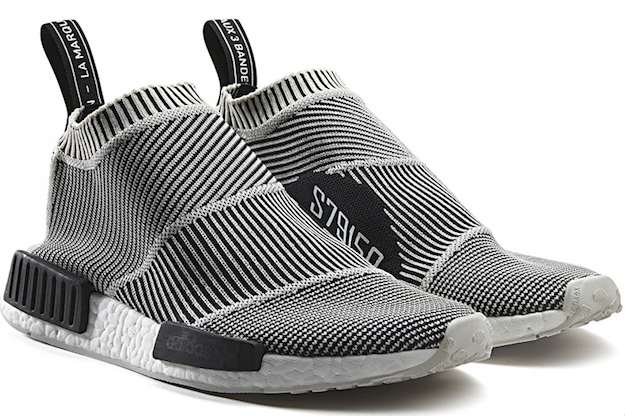 Then, I took a closer look – this version of the pack drops the primeknit sock sleeve and changes the body to a large hole mesh. 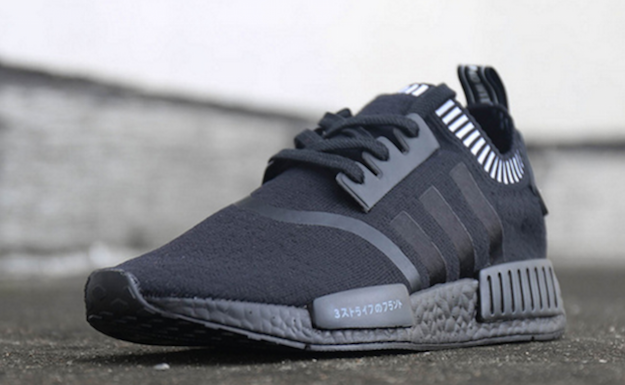 Following in the same path as the PK monochrome pack, the 2nd colorway is also double black. The body also features the large hole mesh – these are an incredibly sleek version, really feeling this colorway. 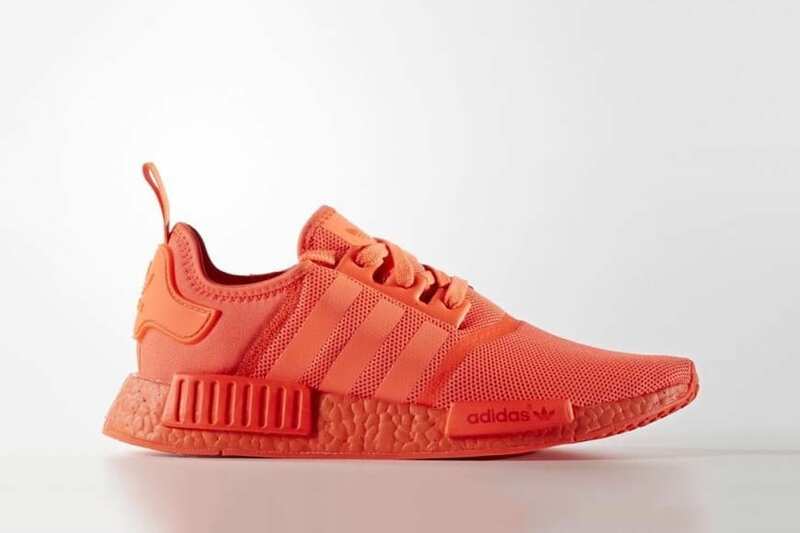 With the massive NMD release on the 17th, these blue versions of the orange / red / black will drop as well. 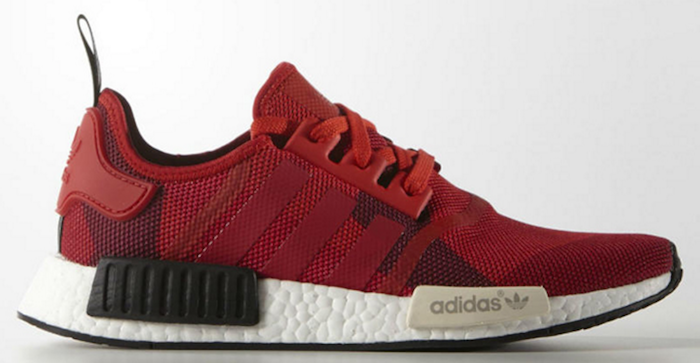 I almost wished adidas staggered the date on these a little bit, there’s way too many clean choices in the drop! 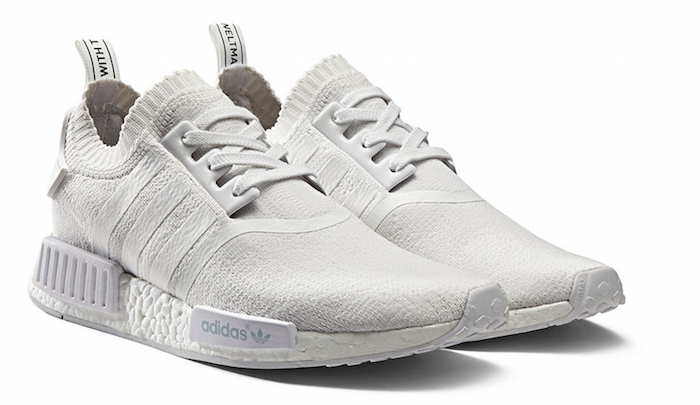 A different take on the black OG NMDs, these feature an all white bottom (plugs included) and light grey back and three stripes. These were only available for a limited release online, but are rumored to be stocking globally on mid May. 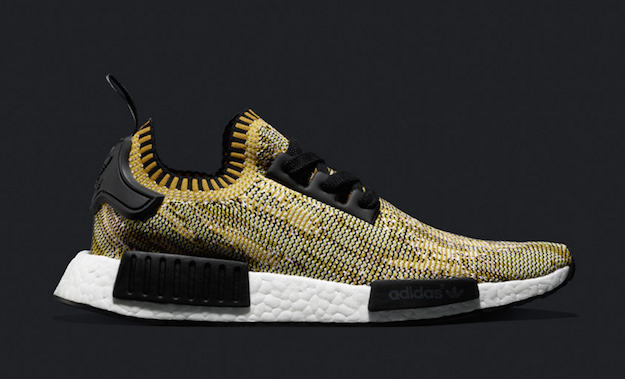 Much like the triple blacks, a leaked photo of these gold hued NMDs was picked up by Sneaker Addict last month. 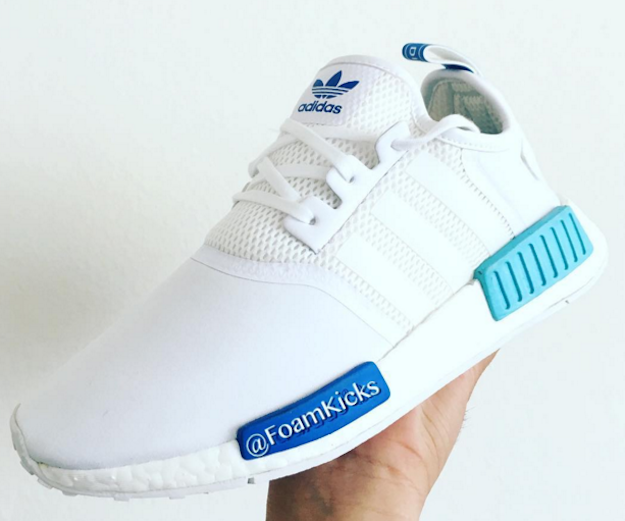 They’ve reported that this colorway will launch in June of 2016. Looking at the image is a little unclear, as they appear to be a mock up, but we’re hoping they do drop! 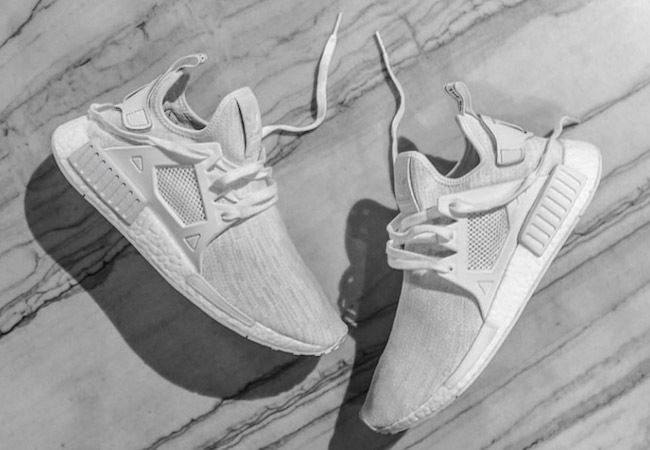 We just got wind from the adidas team that this summer they’ll be dropping a completely new line of the NMD – the XR1. 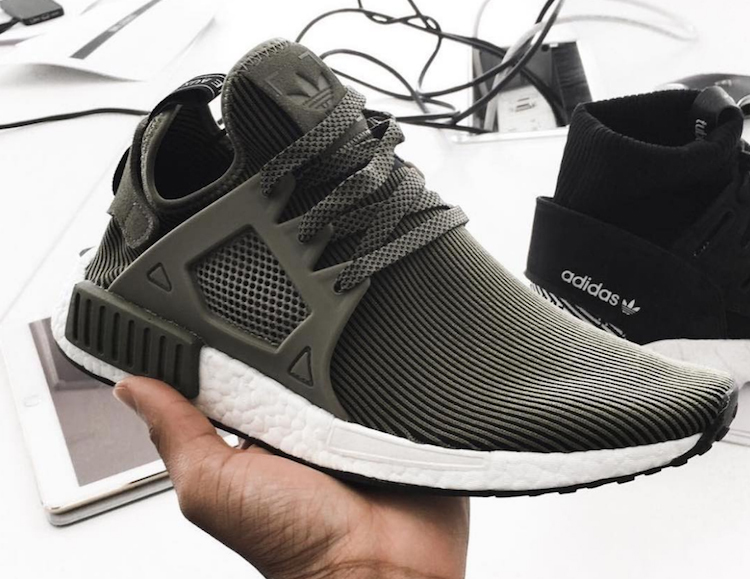 The XR1 appears to have an external caging wrapped around the outer sole, very similar to some huaraches. Once we get more word on these, we’ll be posting it here. I saw this today when I was scrolling down my Instagram feed on BoostVibes (BoostVibes curated the image, the original shot is from Luxe Luce) – the XR1 in all olive with white bottoms. We still haven’t gotten a clean look at the all white XR1s, but it looks like the body of the olive is slightly different, with light grooves running vertically up the tongue. Also, make sure to check out BOTH @BoostVibes and @luxeluce00 on Instagram, well worth the follow. This colorway is perfect for summer – any icy grey (which almost looks gold in the images) comes wrapped in the primeknit body with the iconic three strips down the side. This colorway is perfect for summer – It’s highlighted by “The Three Stripes” print all over on top the shoes. This colorway gives a similar vibe to the iconic “Red Octobers” seen with the Air Yeezy. 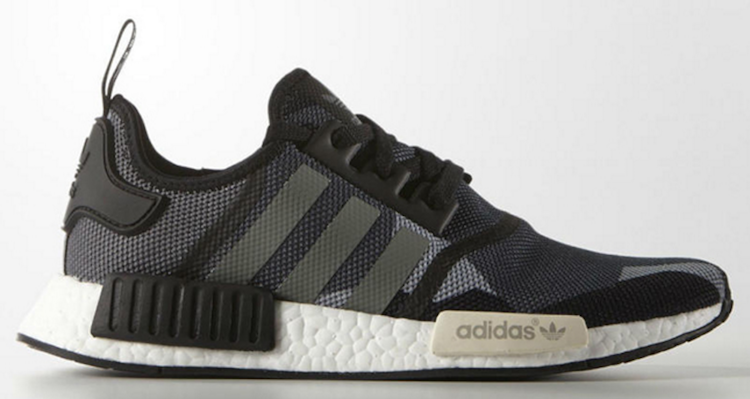 Sneakersheads will enjoy the same comfort and breathability found in every other NMD R1. These are slated to hit stores in mid-Septemeber. Did we miss any? Please leave them in the comments! I like the suede blacks! Them some nice kicks! I’ll stay tuned for official on them. I’m a big fan of Adidas shoes. I’ve been using them ever since I was a child. It’s nice to see such a vast range of sneakers…will be spoiled for choice! I usually prefer all plain black designs too. These will be a great addition to my collection! I’m blown away with the colorful choices in these Adidas shoes. There is a color to suit anyone’s taste. I’m not sure about the soles. They stand out a bit too much for me, but for someone younger, they are very stylish. Good looking shoes. This looks like a great list for people looking for information on Adidas shoes and it gives details that would help them choose a pair. These are the coolest sneakers I have ever seen. Adidas is blowing Nike away. NMD those have to be the coolest. Ready for the street and plush on the feet. The design looks relatively nice and clean. I’m not a fan of loud colors. The simpler-looking tones appeal more to me. The most important thing for me is comfort. I guess I have to visit my favorite shoe store to find that out. LMAO. Good luck trying them on in a store. Wow! Thank you for compiling this list. Yes, this is THE complete list! This is crazy. I don’t know which one I will buy first. I can’t even decide which one is my favorite. Does anyone know the list of online stores that will sell these? Nice collection! 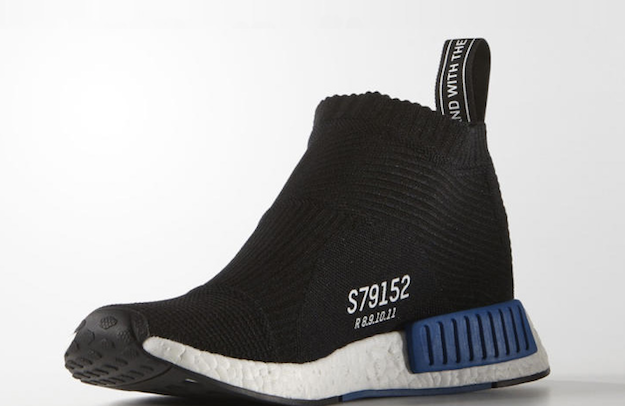 Not sure I’d sport the adidas NMD Runner Mid ‘City Sock PK’ – Black / White, but they surrre look comfortable tho. The red & blacks reminds me of spiderman or sumthin. I can definitely see myself rockin these! I would so love to try the Foam Kicks. I am more of a white shoe person. There are some cool looking black ones but I am more partial to the white boot. Adidas are really upping their game with these new releases! I’m liking the texture and colors, and they all look really comfortable for sportswear. At first, I thought a lot of these look like something a grandma would knit, but I’m starting to get it. They look like a comfortable socks, and they have this hipster vibe that I’m liking. This is what I like about Adidas. There are so many styles to choose from. The variety makes it hard for me to pick which one is my favorite. They are all nice! Value for money in terms of design and durability. I’ll surely check out the local distributor. NMD are my new favourite sneaker. I love the sock tops! Cool new designs, but the original Runner Primeknit is still the best look. The yellow golds are definitely fresh but I don’t know if I would be daring enough to wear them. I think the blue mesh pack is a better option because I could wear them with more of my clothes and for more occasions. WOOOW!!!! 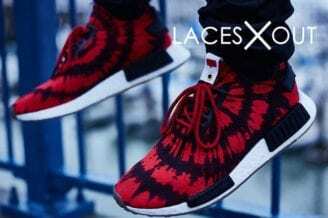 I just love all the designs it is going to be hard to only buy one pair, sooo I suppose I have to save up my money, Because without a doubt I will have to buy at least three pairs 1. adidas NMD Runner “Vintage White and Lush Red” 2. adidas NMD “Geometric Pack” – Red / White 3. adidas NMD “Mesh Pack” – Navy Blues. The Yeezy’s are going to be a total game changer for Adidas. I feel like the brand is really going for it this year, and these fresh new styles are going to catch a lot of attention. They’re already catchin attention. I don’t think I will buy a pair but they will sell for sure! Thank you for updating the list! I think my favorite is the adidas x Nice Kicks NMD R1 PK Runner! This is list is super awesome! I think I am ready to get new sneakers soon! I just love nmd chain metal and monochrome triple whites! Cant wait to get my hands on them. I guess I just don’t get what they are trying to achieve. I don’t care much for this new style. I usually love Adidas, but these don’t speak to me. I think I will stick to the old style Adidas. Deez adidas tight too. I can rock those red & blacks! These NMDs are fire! The colorways are great too. Adidas is truly a world class competitor! These shoes come in lots of cool colours and patterns. Nice job Adidas. Although the shape of the shoe reminds me of a ducks bill. I think I’ll buy the double blacks for my BF and then imagine his feet are quietly whispering, “quack, quack, quack quack” as he walks. 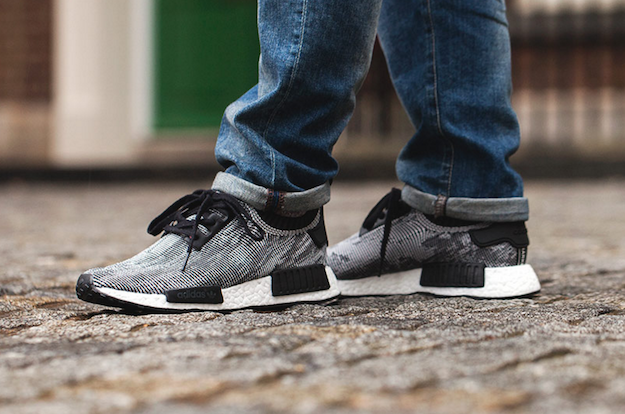 I’m waiting on those NMD Primeknit “Camo Pack” to be released on the 9th. They got a unique look. Will be one of the first to get them! 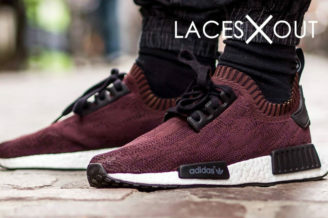 Those adidas NMD Runner Mid ‘City Sock PK’ caught my eye! You’re right, they do kinda look like a sock or something. Nice list Ryan! I like all the Adidas selections here. Will share this on FB & twitter! The price of sneaks have really gone up. I remember when you used to could get them for a bill or less. Now they’re pushing $200 for these name brand sneakers! My son wants a pair, but he will surely have to earn them that’s for sure. Got a lot of mesh looks and styles these days with adidas. Guess that’s their thing now. 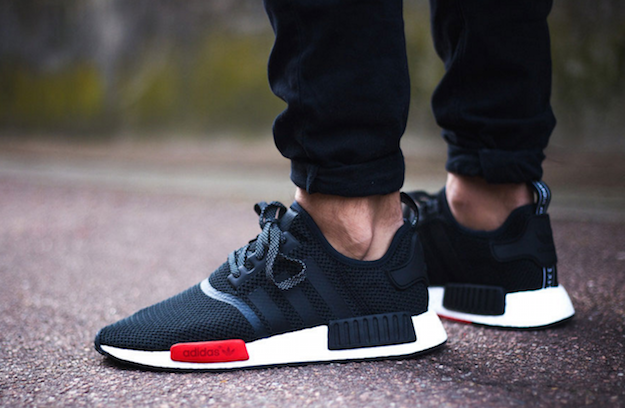 I like those adidas NMD_R1 Primeknit “OG” Black. The soles on them are awesome! 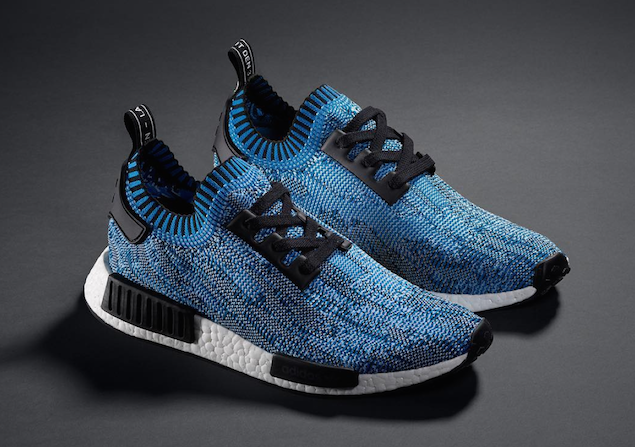 Hey… Does anyone know where to find either the prime knits or the original R1 nmd’s? I can only find on eBay for triple the price.. Please help! Did they ever release a PK in Beige? Someone on eBay is selling them but I’m unsure if they are fake. i havent seen those yet, be careful on ebay, hella fakes! 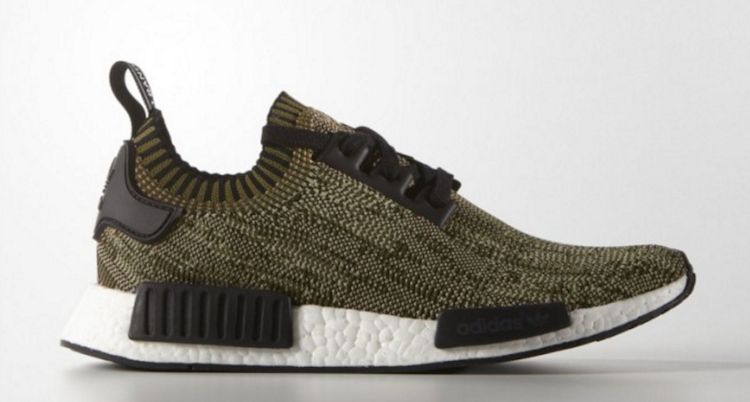 Anybody knows where i can buy adidas nmd olive ?? 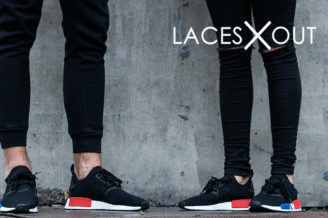 Where I can buy their NMD shoes? Is it in their online store? Where and how will I know if there are NMD releases in the Philippines? right now were only tracking US and UK release dates, apologies! Where can I find these shoes, or the release dates? they’re all located in this article…if theres something not listed, check adidas website. 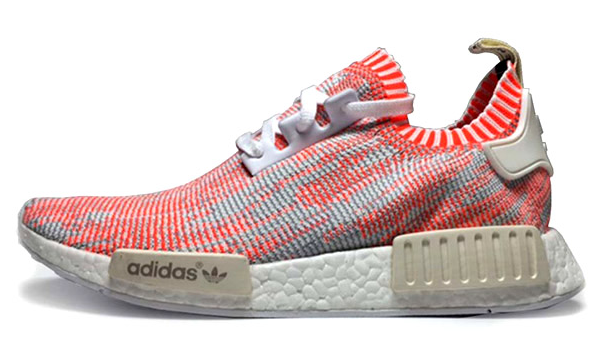 Were the NMD runner in Vintage white and lush red shoes release in May of 2016 in the US? No, they’re releasing in the summer. Just a heads up, you’re most likely not gonna be able to get them. I had 5 different websites crash in a row when I tried to get them. What websites can you find them on ?? I’ve been constantly checking websites to cop a pair of these shoes and all of them are legit sold out. Saw some at the mall but they weren’t the ones I wanted. I really want a pair. I bought a pair of white NMDs at the flagship Adidas store in Tokyo a few days ago. It’s not your site though and I’ve no idea what these are called. Where can I post them? Did you find a store to buy them from?? Where can you buy them in store?! Where are the all white with black stripes? 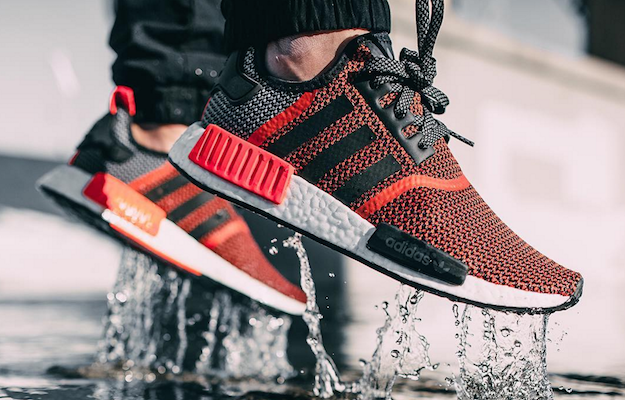 we’re working on updating this post as we speak, adidas is dropping too many for us to keep up with! Does anyone know the smallest size that’s going to be available in men’s sizes? i believe size 7, but i could be wrong! What time will the new nmds drop August 18? 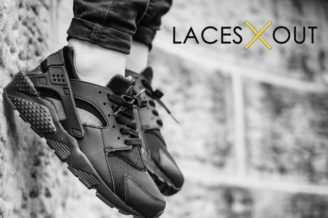 Youre missing the triple black ones also going to be release on the 17th next month. What about the Pharrell NMD’s, the Human Race ones. adding them to the list soon! The List needs to be updated. There’s a ton of new colorways releasing/released. Good work in starting this list!